Now you see it, now you don’t…. A disappearing Through Floor Lift near Dereham, Norfolk. Norfolk Stairlifts have been assisting this lady near Dereham for several years. 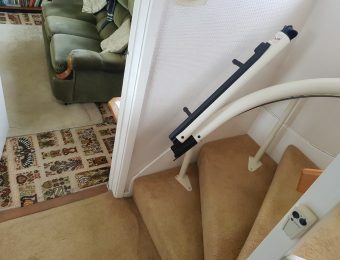 Her mobility in recent times had decreased considerably making the straight stairlift installed by Norfolk Stairlifts unusable for her, with or without assistance. Luckily her husband was at home to assist with day to day requirements. 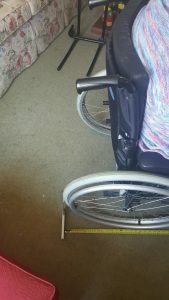 Our user was now having to use a wheelchair to get about the house. Norfolk Stairlifts were asked to reassess the user and the staircase to see if any other options were available to get up the stairs. 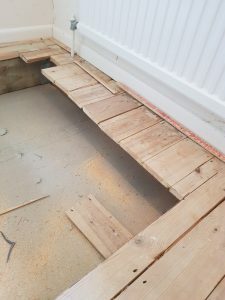 The local authority housing officer and occupational therapist were advised by the Norfolk Stairlifts Surveyor, at a joint site meeting that there were no safe or practical options left to adapt the stairs or install a different stairlift. 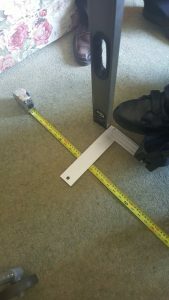 Norfolk Stairlifts were requested to survey for a through floor lift. 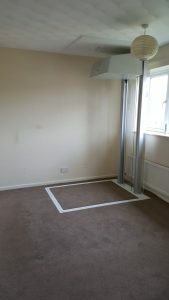 Through floor lifts can be fitted in most properties and can take a passenger seated within the lift or in a wheelchair. It is vital that sizes and weights are accurate. Our issue here was finding a suitable location in quite a small house. 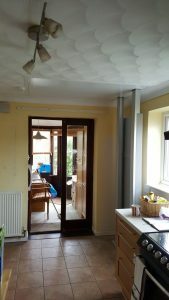 The doorways had already been adapted so the user was able to navigate around the ground floor with assistance. 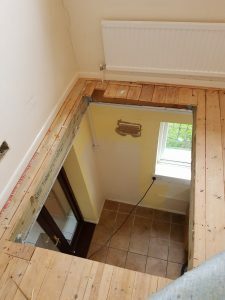 It quickly became obvious that the best compromise was for the through floor lift to leave from the far end of the kitchen and arrive in the spare bedroom directly above. The kitchen looked like this to start with. 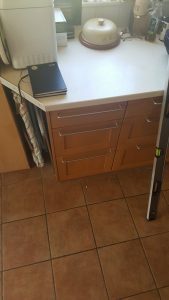 Our surveyor was able to advise on the necessary adaptations required in the kitchen area to keep disruption to a minimum and to ensure the kitchen was left in a usable state. 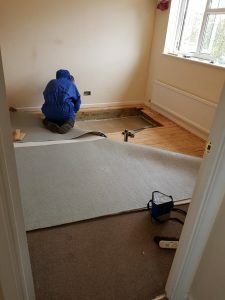 The project was authorised and after all health and safety checks were carried out (including asbestos testing of the textured ceiling covering) the lift was ordered. 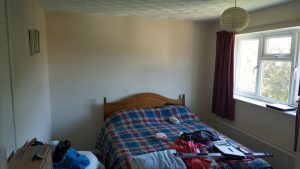 This is the bedroom upstairs, before, during and after! 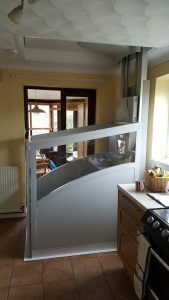 The advantage of a through floor lift in a smaller house is that when the lift is not in use it can be parked out of the way. 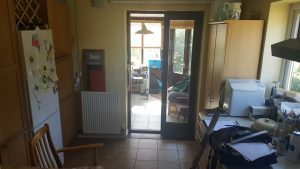 In this instance the space lost in the kitchen is regained and access to the conservatory is available again when the lift is parked upstairs where space is not so tight. 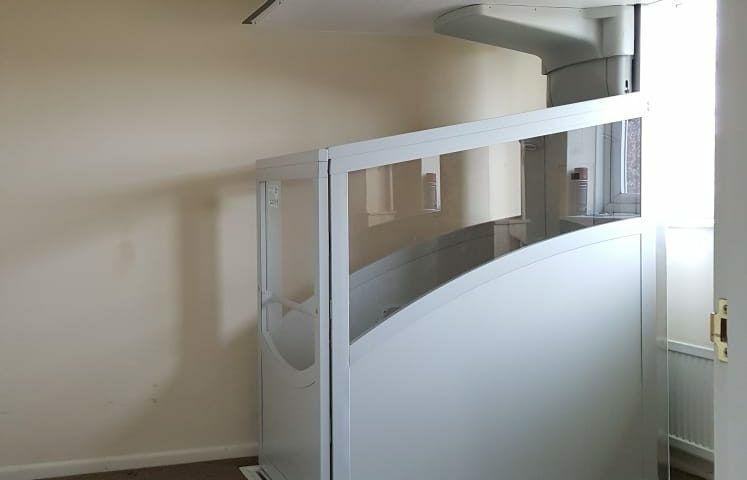 Norfolk Stairlifts have installed many stairlifts and through floor lifts in and around Dereham in Norfolk. 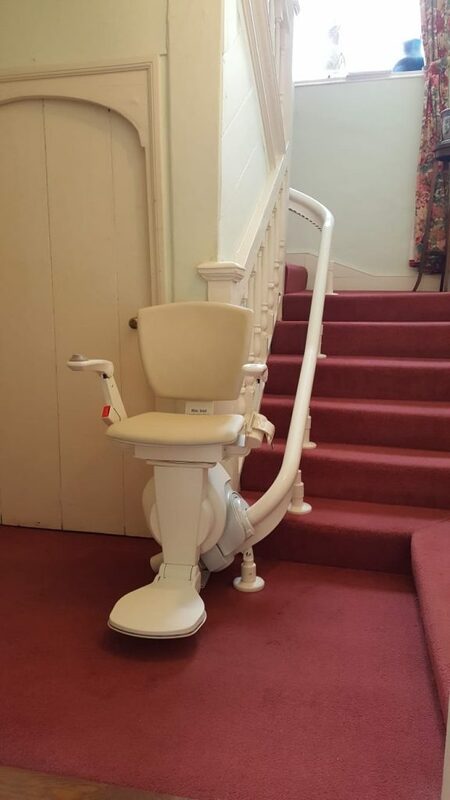 As the leading stairlift company in East Anglia, we’re confident we’ll be able to help. We have showrooms located in Hingham NR9 4LF and in Beccles NR34 9TT. 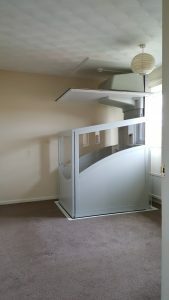 Norfolk Stairlifts is an independent company that installs stairlifts and through floor lifts throughout Norfolk and Suffolk. 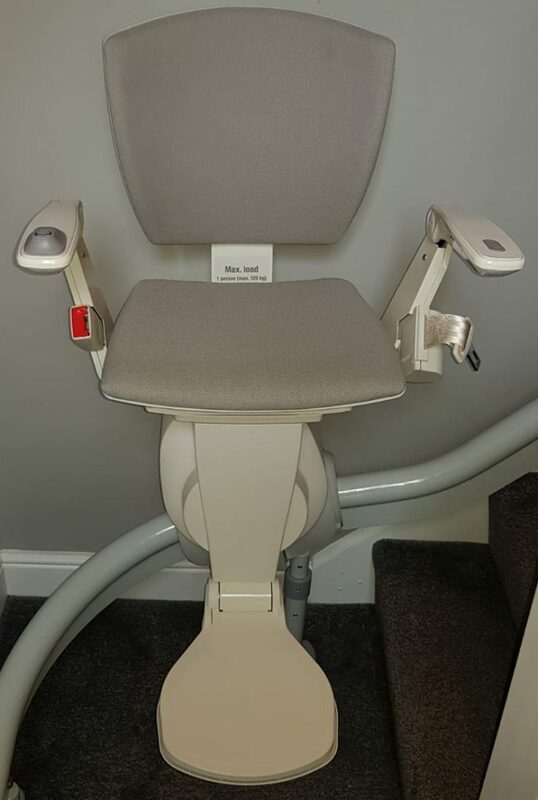 We offer new and reconditioned stairlifts and install stairlifts for both private customers and for 7 District Councils including Breckland, Waveney, South Norfolk and West Norfolk & Kings Lynn. At Norfolk Stairlifts, we understand how a stairlift can literally change people’s lives. 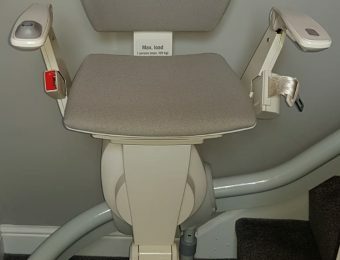 We know this because we have installed over 3,000 stairlifts throughout Norfolk and Suffolk and have seen the difference a stairlift can make. View this Through Floor Lift on our website. 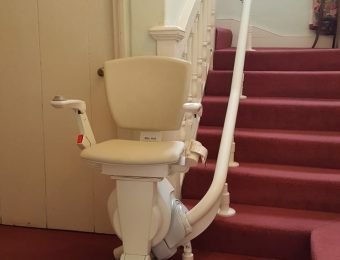 To arrange a no obligation survey or to ask us about anything stairlift or through floor lift related, please click here.